Quinn Martin - Keating & Associates, Inc.
Quinn was 15 years old when his mom sat him down and explained what a Roth IRA was, and why she was taking his Lifeguarding money and putting it away until he was 60 years old. After working several additional summers earning minimum wage, he was interested in how his account was making money without a whistle and lifeguard visor on. Quinn loves what he does because he gets to work with a creative and brilliant team that helps wonderful people make smart decisions with their money. The most fulfilling aspect of his work is when clients discover the peace of mind that comes with a well-planned financial strategy. He holds the Series 7, 65, and 63 investment licenses, and is actively working on his CFP designation. Quinn has a bachelor’s degree in Financial Planning from the University of Illinois at Urbana-Champaign with a minor in International Development Economics. 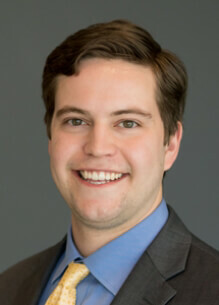 Before joining Keating & Associates Quinn interned at Bluestem Financial Advisors, LLC in Champaign, Illinois. Prior to that he was an unpaid intern for the Financial Wellness Program at the University of Illinois. Quinn currently lives in Roscoe Village, Chicago with two friends from college. Quinn is currently applying to participate in a mentor program for first generation college students who don’t have family to walk them through the trials and tribulations of undergraduate education. In his free time, Quinn enjoys spending time with family and friends, reading, traveling, playing in various intramural leagues and being a devoted sports fan. When clients discover the peace of mind that comes with a well-planned financial strategy.